Waiting for excite enthusiasm for the PSC routine. So the end of the waiting was published psc exam routine 2018. PSC and Ibtadei will be held simultaneously. We will now show you your PSC and Ifteady routines separately. PSC is the primary school certificate, and Ifteedai is under the Madrasa Board. So the examination of PSC and Ibtadei was held at the same time. As a result, results of the test were published on the same date. 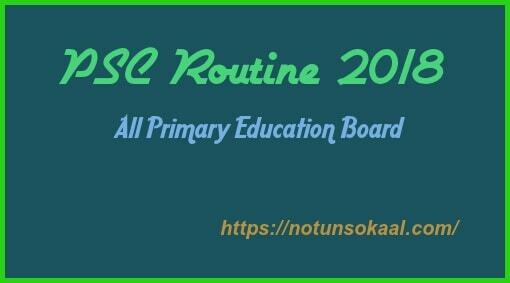 Under the Primary Education Board this year, psc exam routine 2018 has been published this year. According to the directive of the Director General of Education Board, Dr Mohammad Abu Hena Mostafa Kamal, the date of the examination will be prescribed. In the year 2018, the date of the psc exam routine 2018 has been fixed from 18 to 26 November. The signature routine signed by deputy secretary Mohammad Abdul Wahid was published a few days ago. The test starts at 10:30 am on the scheduled day and ends only one.Therefore, the candidates will be present in the examination center at 10:00 in the morning. The 18th test will begin on the basis of the English PSC examination and it will end with the examination of religion. So the test time has been set for 2 hours and 30 minutes The text must be completed within that time. So students should be aware of this during the examination. PDF means ‘portable document format’. PDF is widely used and is now widely used for its clearness. You can download the psc exam routine 2018 in pdf format. In the year 2018, a total of 29 lakh 50 thousand 764 examinees will participate in the seven education boards. The number of boys is 13 lakh 55 thousand 296 and the number of girls 15 lakh 95 thousand 468. In 2017, the overall pass rate was 98.52 percent. Let's see if this pass rate is higher or lower in this year. Now the quality of studies has improved greatly in the past. Primary education has been compulsory. In fact, the backbone of the nation's advanced education. https://notunsokaal.com/ is an educational website. Here you can get all types of exam results, exam suggestions, exam routines and other educational thing. So students stay with us for your educational information.